Helmholtz Initiative and Networking Fund promoting young scientists awards 180,000 € for the study of volcano deformation using radar technology. Geological Society of America Media Highlights Boulder, CO, USA - Topics: new insights into the relationship of megathrust earthquakes and volcanic eruptions. 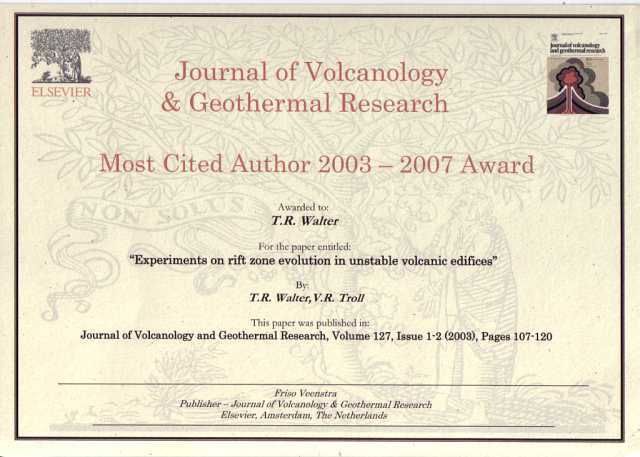 Most cited paper in Journal of Volcanology & Geothermal Research (Walter and Troll, 2003, Experiments on rift zone evolution in unstable volcanic edifices, J. Volcanol. Geoth. Res., Vol. 127, p. 107-120) was awarded with a huge plate of spare-ribs at EGU meeting, Vienna 2007.